1. James Madison Blevins b 1856 Wise Co VA; m. Sarah Mullins b 25 Jun 1857 Pike Co KY d 17 Jun 1945 Pike Co KY; d/o William Mullins and Sarah Ann Bates. 2. Sarah Jane Blevins b 3 Sept 1858 Wise Co VA.
3. George Hopkins Blevins b 1861 Wise Co VA.
5. Elizabeth Blevins b 10 Feb 1867 Wise Co VA.
1. 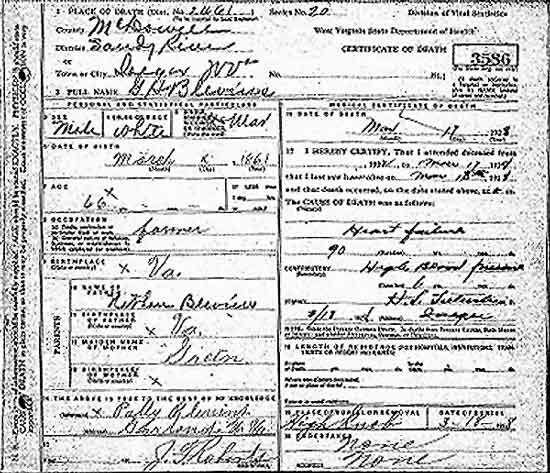 Robert Blaine Blevins b 2 Oct 1871 d 25 Aug 1927; m. 23 Dec 1880 McDowell Co WV to Mary Necatie Steele. Robert Blaine Blevins m. about 1897 McDowell Co WV to Eliza Jane Deskins. Robert Blaine Blevins m. 24 Jul 1909 Wyoming Co WV to Waite Steele. Robert Blaine Blevins m. before 1920 to Polly Ward. 7. Abby "Polly" Blevins b 1883 d 17 Mar 1931; buried Blevins Cemetery, location unknown; m. James Payne. Thanks to Sue Blevins Kovack for submitting information for this family on 12 Jan 2009 by email and 26 Aug 2009 by email. More about the Blevins and Related Families. Please Note: The Previous Link No Longer Works. The Website is No Longer There.